Debby Kaspari (https://drawingthemotmot.wordpress.com/) and I are off on another adventure! Our first collaboration resulted in “In History’s Footsteps,” (Nuttall) published in the March/April issue of Oklahoma Today magazine. 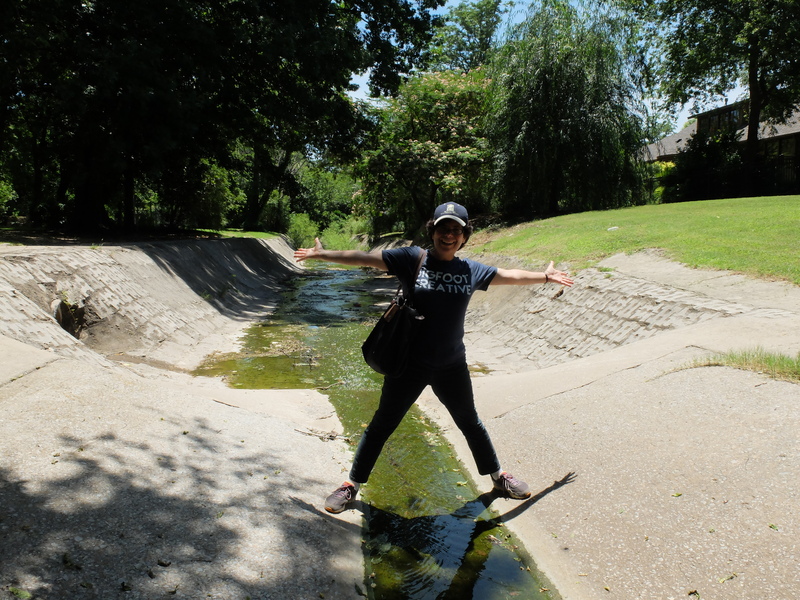 In “Follow the Rivers” we are focused on the blessings of Oklahoma’s natural rivers, in stark contrast to concretized streams like the Los Angeles River. Illuminating the reasons we should appreciate these water resources is part of our goal. Last weekend, we decided to trace one of Norman’s creeks from its source to its confluence with the Canadian River. It was an eight-mile adventure (involving lots of detours and backtracking) on foot, starting just northeast of Andrews Park, where we found Imhoff Creek’s “headwaters” in the back yard of a residence surrounded by riparian vegetation (cottonwoods, willows and catalpa, oh my). 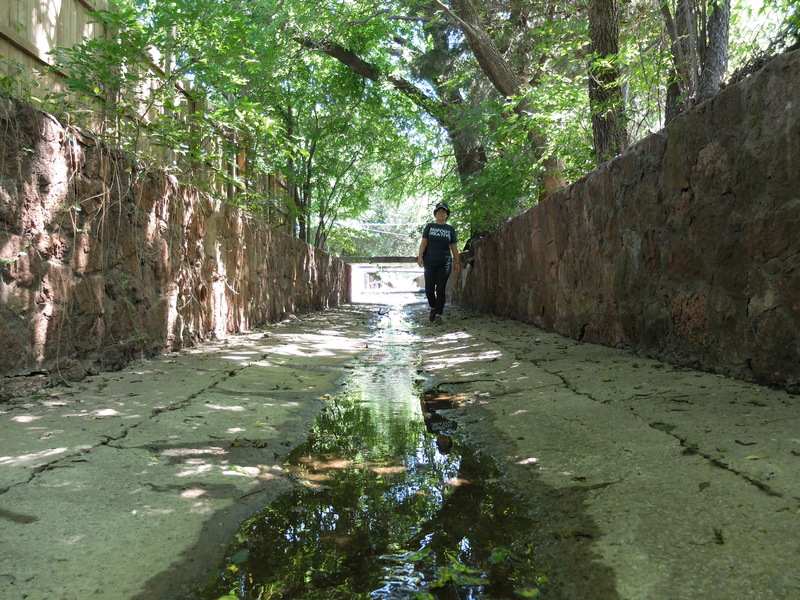 The trickle of water soon became a concrete-bottomed, stone-lined drainage ditch of WPA vintage and ran through Andrews Park, skirted downtown Norman, flowed through Lions Park, and spread out into a wide concrete drainage south of Boyd. We were able to walk either along or in the channel of the creek until we were confronted with creekside fences and dense growth in the stream south of Lindsey. We turned back, detoured to Berry Road, and walked to Imhoff Road, then went through a neighborhood and along Highway 9 to rejoin the course of the creek. 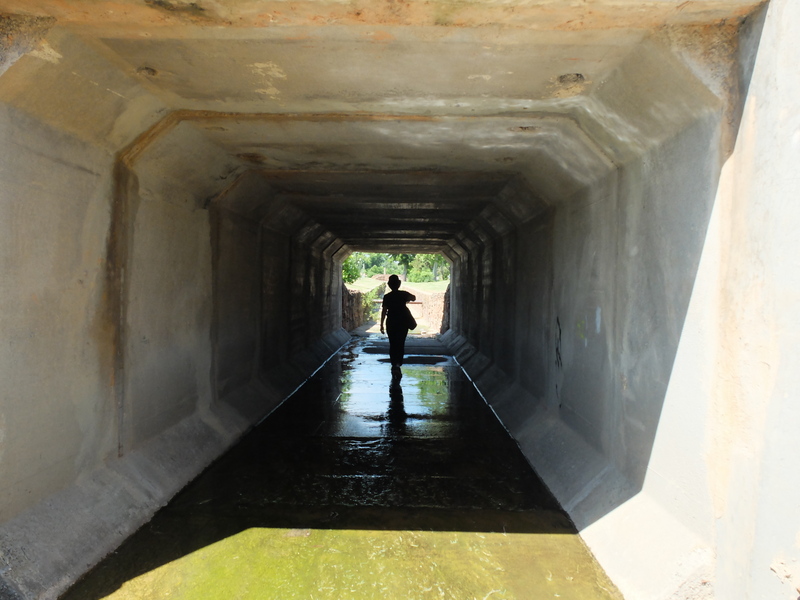 It was an adventure going through a large culvert under Highway 9 and scrambling back up the embankment to walk along the shoulder of the highway to The Trails golf course. There we were able to follow the creek south as it bordered the golf course and, eventually, we made our way to the river. 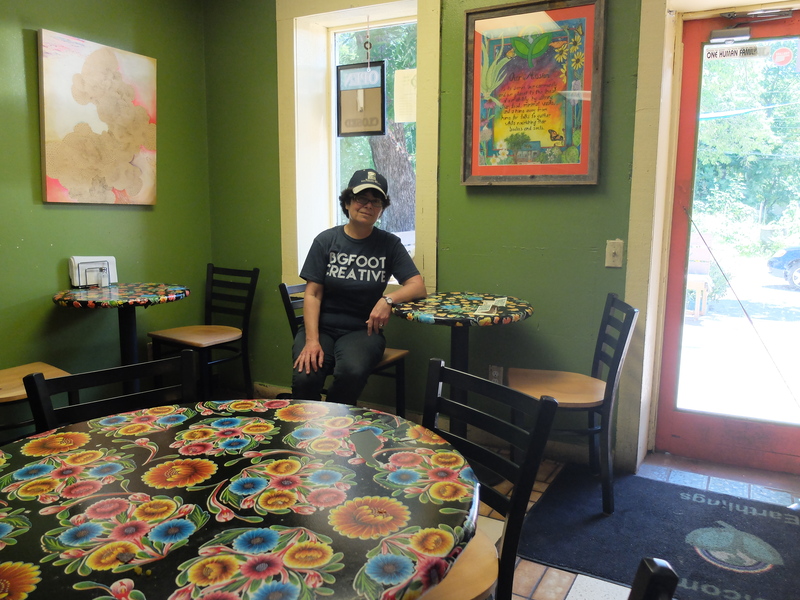 We took a break for provisions at The Earth deli. South of Lindsey we found this area where a permeable surface was allowing habitat to emerge. Debby was joyous! 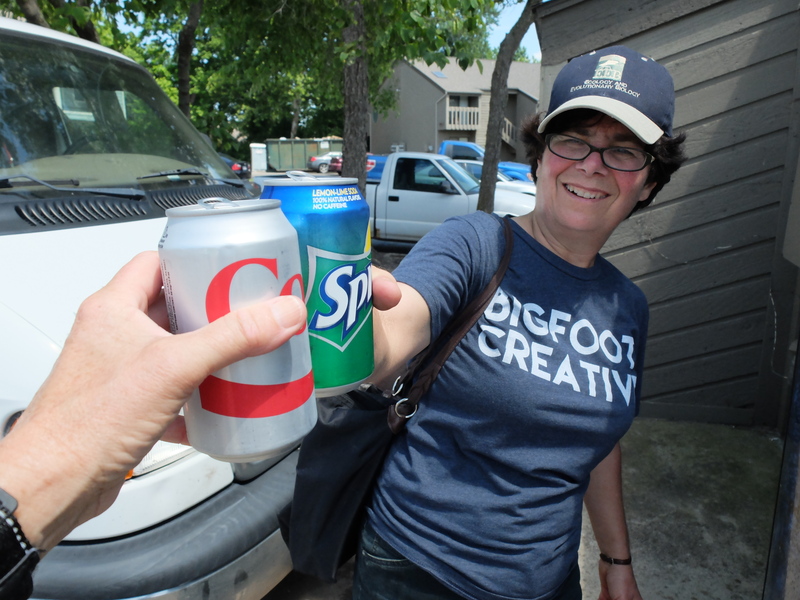 We stumbled upon the civilized luxury of a functioning Coke machine and enjoyed ice cold beverages near the Trails. 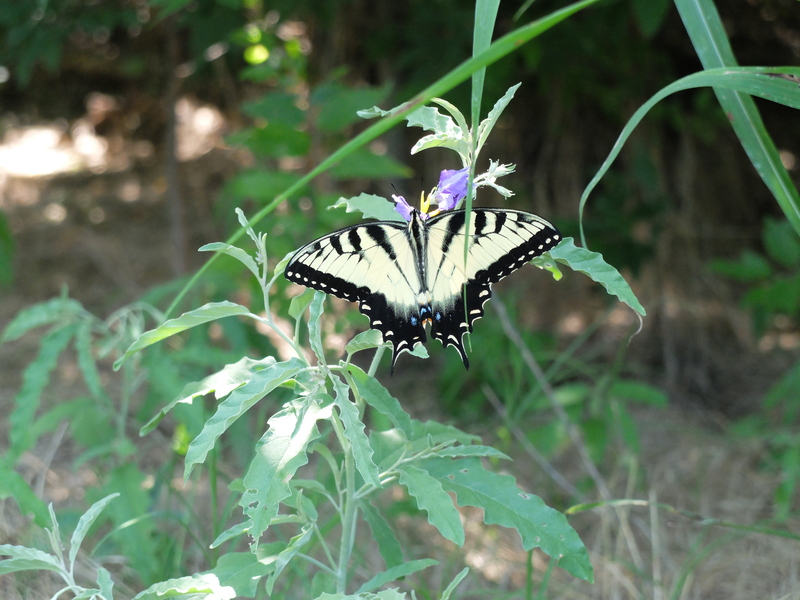 A close-up view of a Swallowtail was one of the benefits of our journey.